Conference Series warmly welcomes to all the experts in the field of " Astronomy and Space Science" during September 16-17, 2019 Amsterdam, Netherlands. 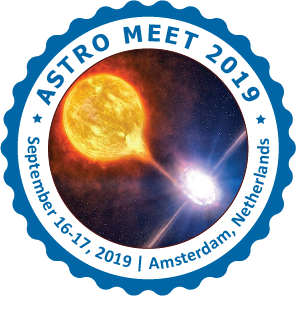 ASTRO MEET 2019 Conference is based on the theme of “Expanding the Horizon of our Galaxy” and it will be a common platform for leading researchers, scholars, scientists, professors, engineers, students and market leaders from all areas of Physics, Chemistry, Mechanical Engineering, Aerospace engineering, Aeronautics, Computational Space Science and other related areas like Plasma Physics, Particle Physics, Astrophysics, Planetary Science etc. ASTRO MEET 2019 conference brings together experts, leading researchers, scholars, scientists, professors from all areas of Physics, Chemistry, Mechanical Engineering, Aerospace engineering, Aeronautics, Computational Space Science and other related areas for interaction, exchange the new ideas and collaborations. Opportunity to attend the presentations delivered by eminent Scientists, researchers, experts from all over the world. Participation in sessions on specific topics on which the conference is expected to achieve progress, Global networking in transferring and exchanging Ideas, Share your excitement in promoting new ideas, developments and innovations in Astronomy and Space Science. Exchange ideas with leading professors, project managers, researchers, Equipment Engineers, Lab Attenders and professionals from all across the globe. Astrophysics is the subdivision of astronomy. Theoretical astronomy is the study of the investigative models of physics, universe and chemistry to observe and analyze astronomical objects and astronomical phenomena which deals with the space science. It uses a wide range of tools which consists of Analytical models and Computational numerical simulations. Space physics is the study of plasmas as they occur naturally in the Earth's upper atmosphere. Accordingly, it includes a far-ranging number of topics, such as heliophysics which also includes the solar physics of the Sun: the solar wind, auroras, cosmic rays, planetary magnetospheres and ionospheres, and synchrotron radiation. Space physics is also the fundamental part of the study of space weather and has a significant implication not only to understand the universe, but also to the real-world everyday life, including the operation of infrastructures and weather satellites. Atomic astronomy is the exploration of the atomic responses that fuel the Sun and different stars over the Universe furthermore make the assortment of nuclear cores and Understanding the hidden astrophysical procedures gives us pieces of information about starting point of the Earth and its creation; the development of life; the advancement of stars, worlds and the Universe itself; the cause of the components and their plenitudes; By distinguishing and dissecting emanations from stars, the dusty remainders from detonated stars and from reduced "dead" stars; By doing hypothetical counts on atomic conduct and its transaction with the stellar environment furthermore by planning research center examinations that investigate stellar atomic responses in the Big Bang, in stars and in supernova blasts. Nuclear astronomy is identified with execution nuclear material science estimations which will be utilized by space experts furthermore utilizes nuclear information to decipher cosmic perceptions. Nuclear material science assumes a pivotal part in astronomy and atomic astronomy is the exploration of the atomic responses that fuel the Sun and different stars over the Universe furthermore make the assortment of nuclear cores and Understanding the fundamental astrophysical procedures gives us signs about starting point of the Earth and its organization; the development of life; the advancement of stars, worlds and the Universe itself; the birthplace of the components and their plenitudes; By identifying and breaking down emanations from stars, the dusty leftovers from detonated stars and from smaller "dead" stars; By completing hypothetical estimations on atomic conduct and its interchange with the stellar environment furthermore by planning research center trials that investigate stellar atomic responses in the Big Bang, in stars and in supernova blasts. Space Missions are rocket investigating Mercury, Mars, Venus, and Saturn, and also a comet and an Asteroids and Life. The Voyager rockets are moving at fast out of our close planetary system while New Horizons speeds toward a 2015 experience with Pluto. Nearer to home, we have tests in a lunar circle; a modest bunch of sunlight-based material science missions, space telescopes, and a little armed force of Earth-watching satellites. In the Earth circle, the International Space Station keeps on taking off around the planet with a constantly staffed team of space travelers and cosmonauts. Correspondences Satellite is a fake satellite that transfers and enhances using a transponder, radio telecommunications signals, between a source and a recipient. Satellites communication is utilized for TV, phone, radio, web, and military applications. There are more than 2,000 correspondences satellites in Earth's circle, utilized by both private and government associations. The term “Satellite Communication” is an artificial satellite that amplifies & communicates radio telecommunications signals through transponder, and it creates a communication channel between transmitter source and a receiver end at the different positions on the Earth. Communications satellites are used for television, telephone, internet, radio, and many other military applications. There are all around 2,000 communications satellites in Earth’s orbit and are interconnected and used by both private and government administrations. Optical telescopes are the most conspicuous, as they are fundamentally the same as those you use in your own particular lawn. Optical space science gives both the most amazing pictures we see and the most essential data we think about our nearby planetary group, the Milky Way, and every one of the systems encompassing us. Optical space science is constrained by both the relative restriction of the optical range and the way that the Earth's own climate shut out and skips around some of this light, misshaping the picture we see. The human nearness is likewise an issue for optical seeing, as light contamination additionally extremely restrains the nature of information you can gather. Along these lines, observatories are typically situated in spots with a low rate of day by day overcast cover (less mists = additionally watching), far from towns and city (less light contamination = better watching), and ordinarily at high heights (less environment = less scrambling). The universe-including Earth, the sun, different stars, and cosmic systems are made of protons, neutrons, and electrons packaged together into iotas. Maybe a standout amongst the most shocking disclosures of the twentieth century was that this conventional, or baryonic, matter makes up under 5 percent of the mass of the universe. Whatever is left of the universe has all the earmarks of being made of a puzzling, undetectable substance called dim matter (25 percent) and a constraint that repulses gravity known as dull vitality (70 percent). Researchers have a couple of thoughts for what dim matter may be. One driving speculation is that dark matter comprises of fascinating particles that don't cooperate with ordinary matter or light however that still apply a gravitational draw. Dull vitality is much more baffling, and its revelation in the 1990s was a total stun to researchers. Beforehand, physicists had expected that the appealing power of gravity would back off the extension of the universe after some time. In any case, when two free groups attempted to quantify the rate of deceleration, they found that the development was really accelerating. One researcher compared the finding to tossing an arrangement of keys uncertain anticipating that they should fall just to see them fly straight up toward the roof. We have instructed some further things about the universe past the close planetary system by locating vast beams, which are for the most part arranged of either nuclear cores less their circling electrons, or one of their fundamental segments, protons. However, these decidedly charged particles don't indicate their place of root because of the attractive fields of our cosmic system which influence their flight ways like a magnet influences press filings. The aggregate number of basic particles in the universe and these impartial feebly cooperating particles emerged to us practically with no inconvenience straight from their sources, making a trip at near the speed of light. A with low vitality of neutrino in flight would not see a hindrance of lead 50 light years thick. When we can see out in neutrino light we will without a doubt get a stunning new perspective of the universe. Material science of the early Universe is at the limit of stargazing and reasoning since we don't as of now has an entire hypothesis that binds together all the basic strengths of Nature right now of Creation. Furthermore, there is no probability of connecting perception or experimentation of early Universe material science to our hypotheses (i.e. it's impractical to `build' another Universe). Our speculations are dismissed or acknowledged in view of straightforwardness and stylish grounds, in addition to their force of expectation to later circumstances, instead of interest to observational outcomes. This is an extreme contrast method for doing science from earlier hundreds of years of research. Radio astronomy is a subfield of astronomy that studies celestial substances at radio frequencies. The first discovery of the radio waves from an astronomical object was in 1932 when Karl Jansky at Bell Telephone Laboratories observed radiation coming from the Milky Way. Following, the observations have identified a number of different sources of radio emission. These also include stars and galaxies, as well as the entire new classes of the objects, such as radio galaxies, pulsars, quasars, and masers. The detection of the cosmic microwave background radiation, regarded as the evidence for the Big Bang theory, was made through radio astronomy. The term “Universe” is all of the space-time and its fillings which include several planets, galaxies, moons, and stars, and the contents of intergalactic space and all the energy and the matter. While the size of the entire Universe is still unidentified, it is possible to measure the observable universe. Discoveries in the initial 20th century have suggested that the Universe had a beginning and that it is expanding at an increasing rate. The majority of the mass in the Universe appears to exist in an unknown form called dark matter. Our universe is both old and unfathomable, and growing out more distant and quicker consistently. This quickening universe, the dim vitality that is by all accounts behind it and different riddles like the correct way of the Big Bang and the early development of the universe are among the considerable riddles of cosmology. Sensational advances in observational cosmology since the 1990s, including the grandiose microwave foundation, removed supernovae, and system redshift studies, have prompted to the improvement of a standard model of cosmology. This model requires the universe to contain a lot of dim matter and dull vitality whose nature is at present not surely knew, but rather the model gives a point by point expectations that are in astounding concurrence with numerous assorted perceptions.